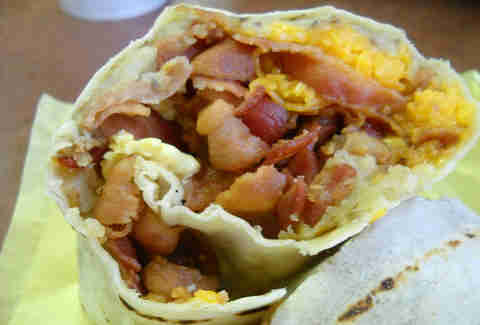 Definitely LA's breakfast burrito king, Lucky Boy -- which, like many of the picks on this list, is more of a roadside drive-up than a traditional "restaurant", so leave your shirtsleeves at home -- stuffs its mega-burritos right in front of you, while never, ever, EVER skimping on meat (so when you order a bacon burrito, you're getting, like, a TON of bacon. 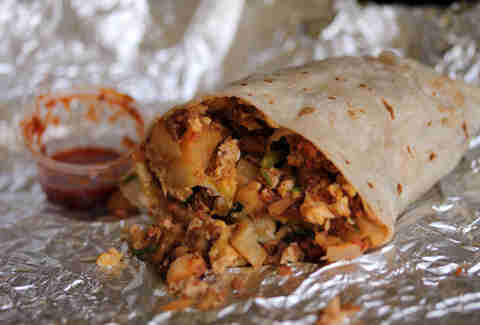 And some burrito). Pro tip: if you're not sure what you want, GET OUT OF LINE IMMEDIATELY before The Guy Who Takes Your Order At Lucky Boy notices. 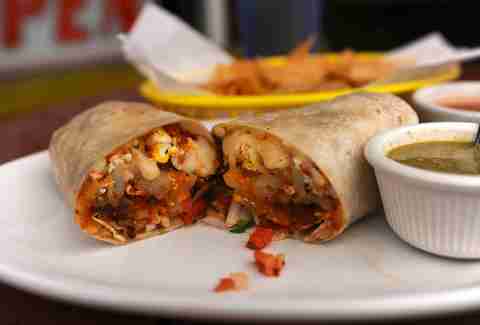 This super-small Mexican deli right by The Grove's an unlikely candidate for breakrrito supremacy, but they kill it. 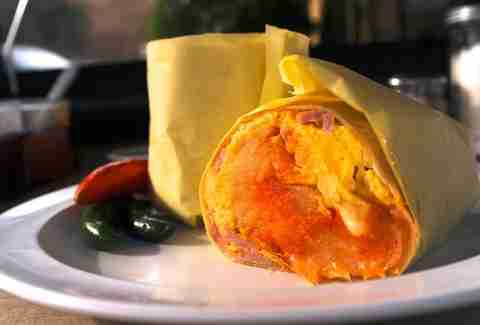 They've got great ratios of sausage-to-bacon-to-cheese-to-potato-to-egg-to-tortillas, with a totally craveable, homemade, spicy green sauce. Also: it's only $5 and served 'til 3pm on weekdays. 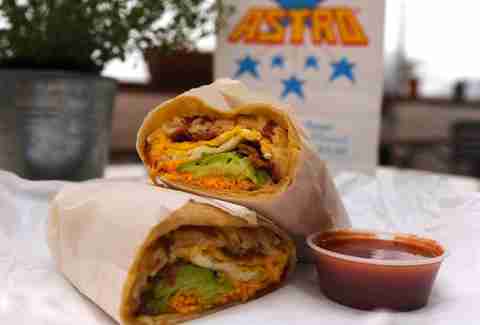 If you happen to work at Paramount, you no doubt know of this legendary burger stand, which not only serves up great ground beefwitches, but also ridiculous breakfast burritos, which've got extra-crispy bacon and salsa rolled right inside, for maximum flavor. 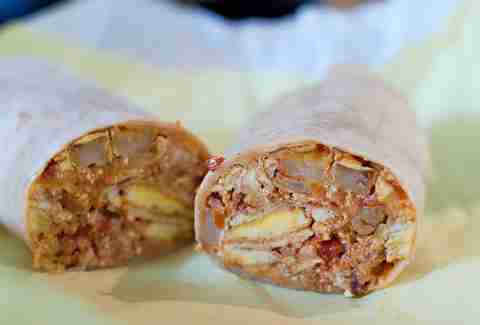 Recently made infamous by Anthony Bourdain -- who totally ruined it for the rest of us -- this family-run, ultra-tiny Eastside staple's always pwned it with the Papas Burrito -- stuffed with your choice of chorizo, bacon, sausage, or potatoes. Not really a deli or a grill (and frankly, not really on a corner either), this's actually a gas station stand with a flattop that makes magic in the form of ultra-tight breakfast stuffers that're packed full of perfectly proportioned meat, eggs, and potatoes -- for $3.99. Yeah. Less than a fiver. 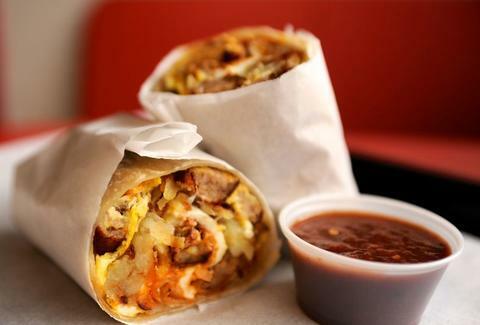 Here's another under-$5, fully-loaded burrito with a major added-bonus: Burger Factory offers delivery, which means there's no need to change out of your Rambo pajamas before you house a pound-plus tortilla-wrapper with avocado and allllllll the breakfast meat. It's not in LA proper, but, yo, OC reprezent: Nick's kills it on the BB front, scrambling chorizo, eggs, and potatoes all together for a log of breakfast awesomeness made even better with homemade, spicy salsa. Oh, and definitely get 'em toasted: they'll toss 'em on the grill for a bit to give them overall warmth and crunch. 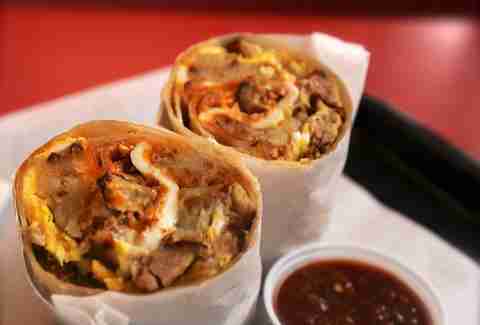 This unassuming hole-in-the-wall's famous for its AM 'rrito option. 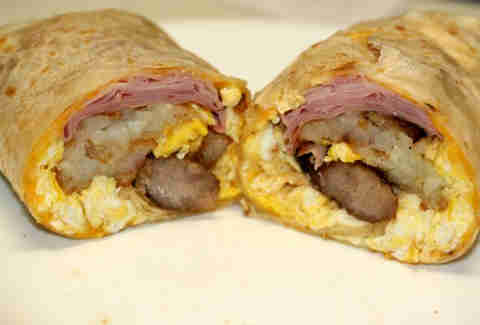 Just add avocado to next-level these guys, which're already stuffed with super-fluffy eggs and crispy hash browns. 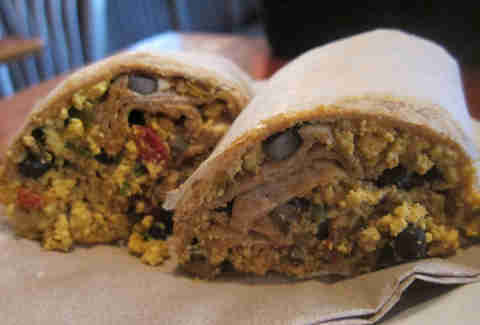 Jeff Miller is the Senior City Editor of Thrillist LA, and generally likes his eggs runny. You can tweet at him at @thrillistla and @jeffmillerla, or check out his food and music exploits at Instagram/jeffmillerla.